Less common but hardly less glamorous than Amanita crocea, the Orange Grisette, the Snakeskin Grisette is mycorrhizal with hardwoods and conifers.One of its older common names is Cecilia's Ringless Amanita, but I can find no information on the particular Cecilia (the saint, perhaps?) to whom this is a reference. 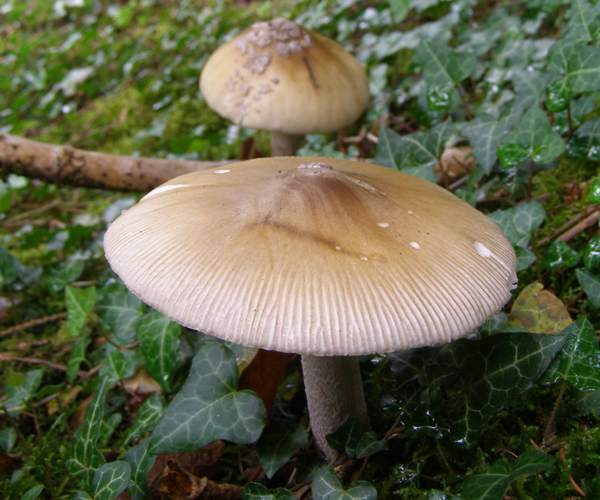 Infrequent in Britain and Ireland but widespread across most of mainland Europe, Amanita ceciliae (or a complex of species similar to the one found in Europe) is also reported from North America. First described scientifically in 1854 by British mycologists Miles Joseph Berkeley and Christopher Edmund Broome (1812 - 1886), this mushroom was originally named Agaricus ceciliae. 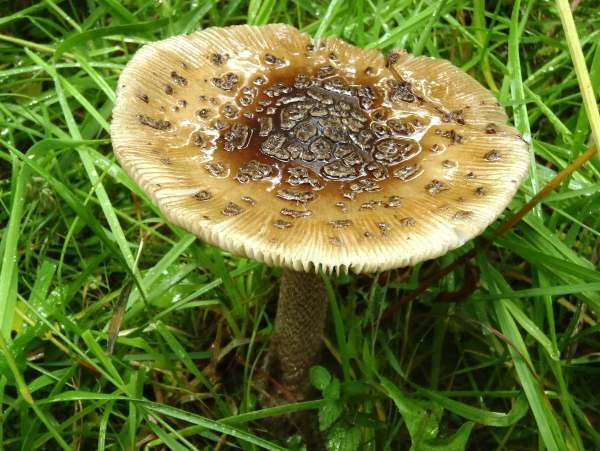 (Most of the gilled mushrooms were included initially in the genus Agaricus!) It was given its current name in 1984 by the Dutch mycologist Dr Cornelis Bas (born 1928). The specific epithet ceciliae is in honour of Cecilia Berkeley, wife of English botanist-mycologist Miles Joseph Berkeley (co-author of this species). This was an acknowledgement of Cecilia Berkeley's involvement in her husband's mycological work. 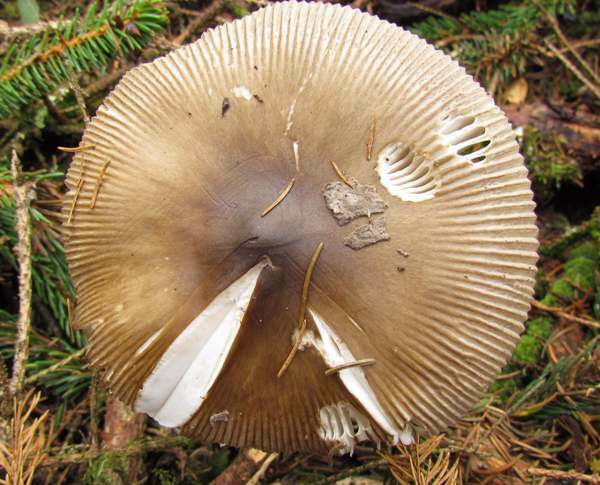 Gills of Amanita ceciliae are creamy white, greying with age; they are free, with many short gills, and only moderately crowded. 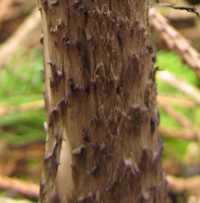 Pale grey background, the surface developing snakeskin-like pattern of grey-brown scales - hence the common name Snakeskin Grisette. 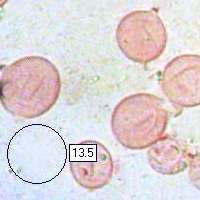 There is no ring on the 8 to 17cm long stem, which ranges from 1 to 2cm dia. The stem base is not swollen. 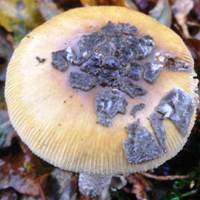 The bag-like white volva of Amanita ceciliae soon collapses leaving patches on stem base. 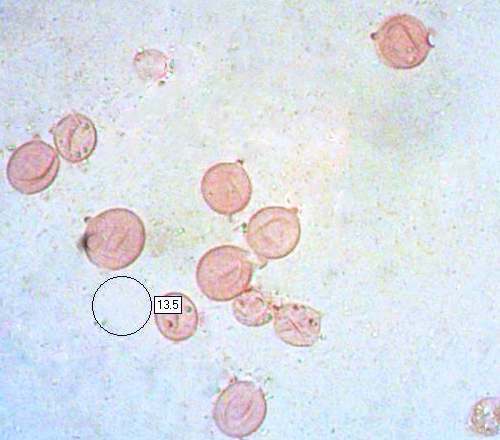 Spherical or very nearly so, smooth, 10.5 - 14µm in diameter, inamyloid. 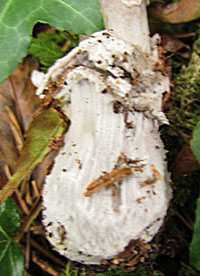 Amanita vaginata has a smoothish stem without a snakeskin pattern. Amanita fulva has a tawny-orange cap and white gills. Amanita crocea is orange and has a snakeskin-like pattern on its stem. 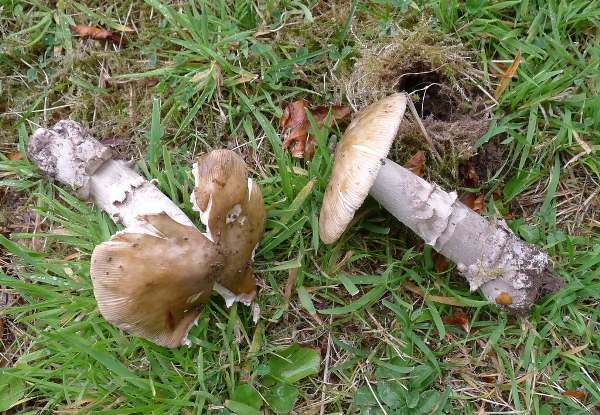 Unlike some of the other ringless amanitas (commonly referred to grisettes), this mushroom is reported to be at least slightly poisonous; however, in Wild Edible Fungi: A Global Overview Of Their Use And Importance To People by E. R. Boa, Amanita ceciliae is listed as 'food'. 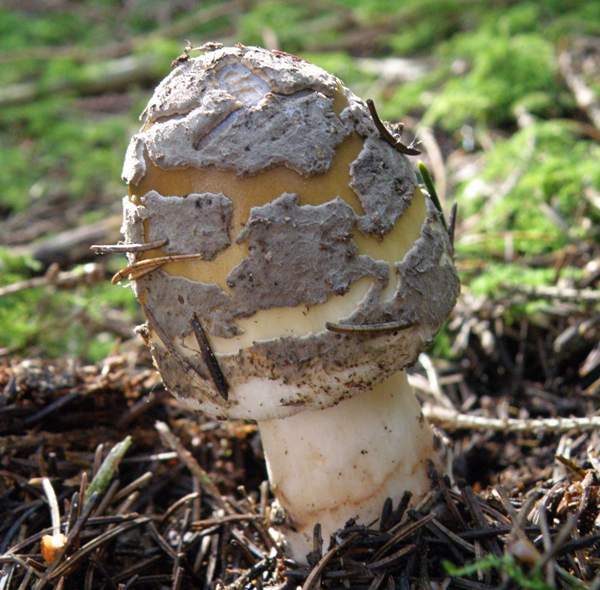 Some authorities state that this species is 'not known to be edible', while many field guides warn against collecting Amanita ceciliae because of the possibility of confusion with deadly poisonous Amanita species, and so my advice is that it should not be gathered for eating. Funga Nordica: 2nd edition 2012. Edited by Knudsen, H. & Vesterholt, J.
Kibby, G (2012) Genus Amanita in Great Britain, published by Geoffrey Kibby. This page includes pictures kindly contributed by Simon Harding, Alistair Hutchison and Adam Pollard.